Having debuted to swarms of critical praise back in 2009, ABC's Modern Family has been a well-oiled machine for several years now. Now in its sixth season, the half hour comedy still proves to be popular with fans, consistently pulling regularly high ratings. In a bid to shake things up for fans and production crews, series co-creator Steve Levitan plans to shoot one of the weirdest tech-driven episodes in the show's history, one that's developed entirely in the world of cyberspace. 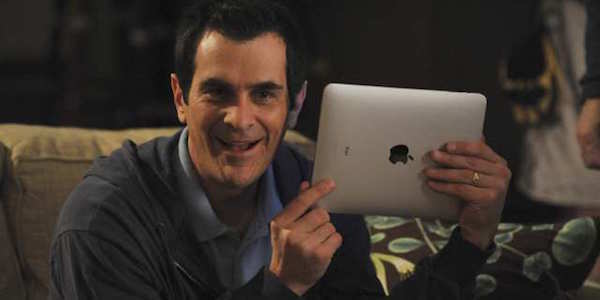 Fans of Modern Family are probably used to seeing Apple gear within the show. Their tech products routinely appear alongside the dysfunctional family and even provided a central storyline back in 2010 when the iPad made its debut to the general public. I had emails open, some websites... then my daughter showed up [on FaceTime]. I could not only see her, but I could see me, and there was something going on behind me, my wife or somebody. I realized on that screen, you could tell so much about my life. The “in-progress” version of the upcoming episode featured Claire relying on her laptop to get in touch with her family, popping up on their own tech devices, all in an attempt to find the missing Haley. Mitch (Jesse Tyler Ferguson) finds himself faking surprise that he has yet to receive Claire's birthday gift; something she searches for desperately online. It sounds like the upcoming bizarre episode of the Emmy-dominating show will be Claire-heavy. While I find Claire to pretty hilarious, I tend to be more of a fan of the Phil (Ty Burrell) episodes. Also, Claire has a tendency to take the stressed out, frantic thing to levels that sometimes stifle the comedy. Regardless, showing the communication advantages and disadvantages that can result from the use of technology should prove a strong base for creating comedy. Tune in on Feb. 25, 2015 to catch ABC's Modern Family “Connection Lost.” Since it is still over a week out, tide yourself over with this little awkward family photo of the Dunphy's.